Good Monday to you folks! How did that weekend turn out for you? Good i hope. We are well an truly cream crackered over here. After a weekend of celebrating Neo’s birthday it’s kinda nice to get back to normal. The lucky thing had 3 days of fun, family and cake. Well you’re only 2 once aren’t ya! I absolutely loved this outfit, it was just plain easy. Bar the one exception of the dress length, it did feel a little, um, flyaway, but apart from that super easy, super lovely. And the red blazer, yes its still love. It’s not monogamous though i have to say, i do see other blazers from time to time but old red here still has a big place in my heart. I’ve gone from owning zero blazers to 3 in the past 6 months. Jeee maybe i’m growing up? Or maybe the cardigans just needed a rest before they all ganged up on me for being over worked. Meh, who knows. I really would be lost without her, nobody would laugh at my crappy jokes any more or humour me when im grumpy. Plus shes pretty awesome and gives me free fabric. Oh yeh, she’s definitely a keeper. Ok then you lovely ladies , have yourselves an awesome week. Ps, if you’re new round here, HI!!! And thanks so much for following along, its so nice to have you here. Love the blazer!! Have been telling myself I need to invest in some statement peices all summer. Can't believe you got that dress at such a bargain price! you suit red so well! I love it on other people but not so much on me. Oooh how funny that you describe your relatinship with your sister like that-it's the same with us, like the friends quotes too! Anytime any of us says the word minion, we know each is thinking of that episode in Friends where Rachel gets that bald cat! And I was in France on holiday last week, sharing tales of my sister and I keeping ourselves occupied on a car journey for two hours by trying to sing 'Any dream will do' as a duet, staccato (every note/word sung really short) and collapsing into giggles every time we got to the Aaaaahs. The people to whom I was regaling this tale were none too impressed- they looked at me like I was a total freak! I suppose you had to be there! Anyway, enough about meeeeee, oh how I do love yonder red blazer also, it is a sight most beauteous for weary eyes! I would but whisk such a paragon away if I were able! Also the handbag is very very cute too! Hope you are well! You are so wonderful in polkadots and red, my dear rachel. And reading about you and your sister is just like reading about me and mine… you find things hilariously funny that no-one else does! It was all so true! Thanks for the love on my blog! I have added the buttons to my sidebar now – I will be adding bigger ones so hold off a few days if these are too small…. thanks sweetie sooooo much!!!!! Found your blog from the YOLO linkup. That red blazer and matching red lip is so gorgeous on you. I'm in love with your bag…I've never seen anything like it before and it's just so darn cute! Isn't having a sister the best? My sister and I are very close too 🙂 I'm a new follower! 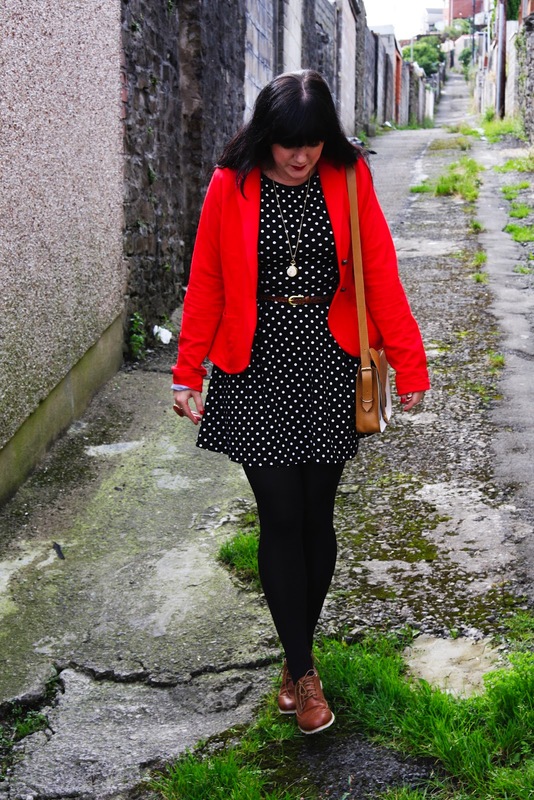 I love this polka dot dress and how you've styled it – so adorable! Sister-love is a wonderful thing, isn't it? : > Thanks so much for linking up to Visible Monday. Yay for sisters and AWESOME OUTFITS! Love the whole thing! Found your link on YOLO! I'm loving this outfit so much! Hearing you talk about taking pictures with your sister, definitely makes me miss my own, living 2 1/2 hours away right now. Sisters are amazing things, aren't they? Im obsessed with the blazer, so cute! Thanks for YOLOing with us, I'm your newest follower and can't wait to read more! loving the bag and hon and I am loving blazers in all colors..totally a must..a structured blazer thrown over anything makes for a great layer! Awesome polka dots and red together. Love it! 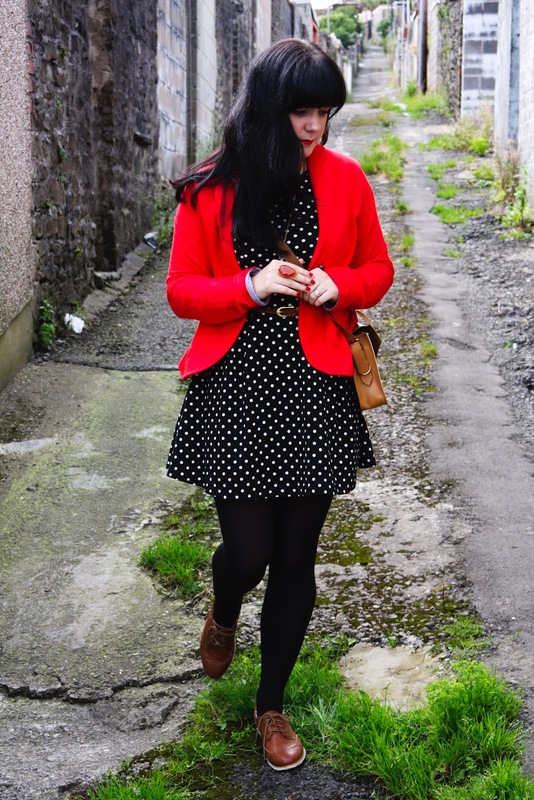 Polka dots and a red blazer can't go wrong! I think my cardigans also needed a rest, so I have also been wearing my blazers a lot lately. Another winning outfit, sweetheart! 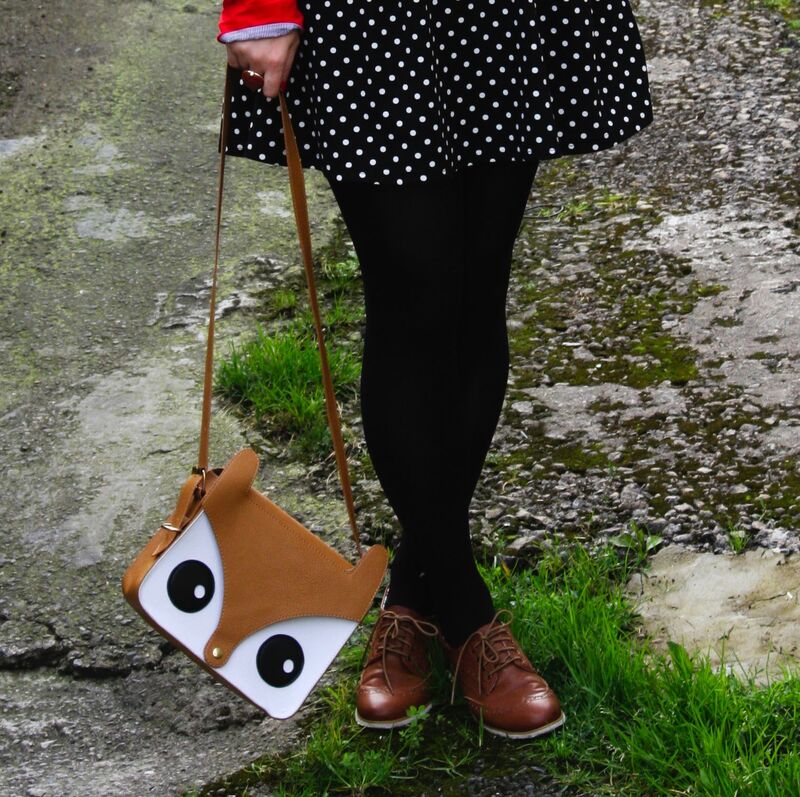 I'm happy to see you rocking the brogues w/ a dress & tights – looks so fab! 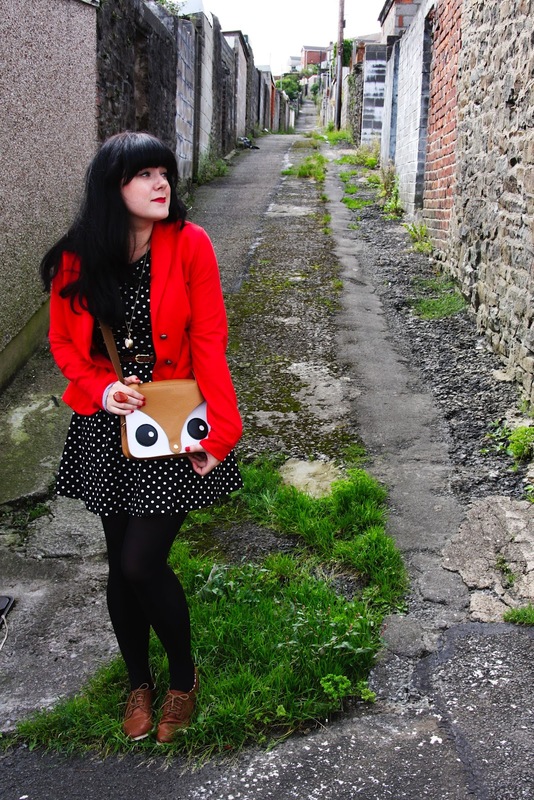 Your red blazer just makes the entire outfit *POP* – that and the owl bag are so much fun!! 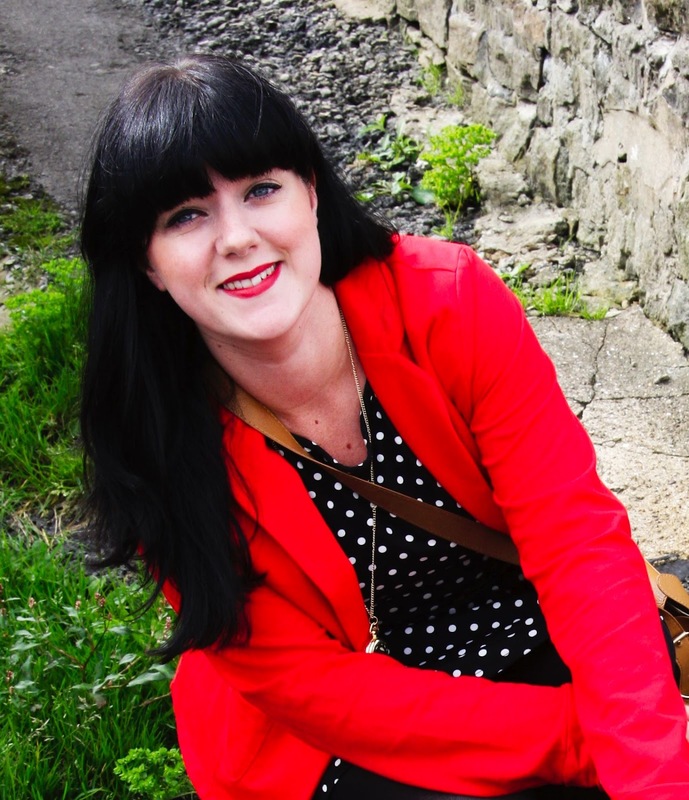 Jet black hair and red – always go together! Popped in from NDYS' Visible Monday. My sister and I would never have come out with such great pics! 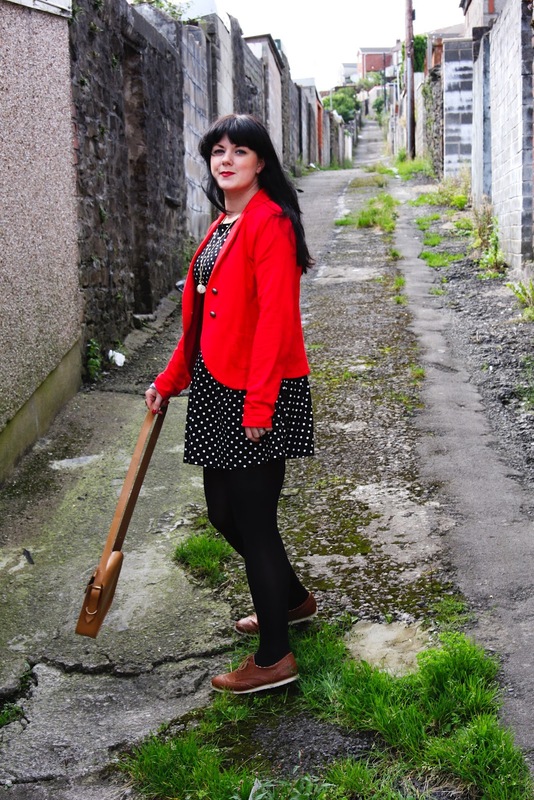 Nice job 🙂 Love your blazer…perfect red, perfect cut and perfect with polka dots and foxes ! you look gorgeous! i love the pop of red in that blazer, beautiful! Rachel, you are a doll! I just love black and brown together – another combination favorite! And it's honestly soooo easy to do this wrong, but once again, you do it so right. 🙂 Especially those oxfords and that too-stinkin-cute owl bag! You're lucky I don't live near you – you might have found that missing by now. hahaha just kidding. And oh, I could talk about sisterly love forever. 🙂 They really are the best! Oh my goodness – the bag!!! Obsessed; it is so darn cute.